The Hold that Thought part was because all the ingredients of this post have been percolating around my brain for a few weeks and I'm under pressure to get them down in writing by the end of the month so I can propose some talks at an upcoming round of conferences this year. At some point you have to start writing about them. This post is my attempt at grabbing that tiger by the tail and wrestling it to the ground where I can get a grasp of all the ideas at interplay. I've laid claim consistently to the term since then, as I've documented here in links to a dozen blog posts and presentations from 2009 to 2013 where I mentioned SMALL. In 2014 I articulated my position on SMALL in a book chapter (Stevens, 2014), available at http://tinyurl.com/small2014. Despite my frequent 'mention' of it over the years, my acronym never got traction, mainly because there were so many other good acronyms out there trying to make the same point. The point is, as Stephen Bax was arguing eloquently and prolifically at the time, computers had been normalized to the point that the 'computer' part of CALL was hardly any longer meaningful. Many replacements for the C word had been suggested: MALL (mobile assisted), TALL (tech assisted), TELL (tech enhanced), MALL (mobile assisted), BALL (blog assisted), SNALL (social network assisted) etc. and these often came up in conversations where I would put forward my own choice of acronym, but I could see that there was a variety of opinion on the matter, all with more or less equal merit, and therefore the best course of action was the one with least resistance, just continue using the term that everyone was familiar with and that everyone understood to be the umbrella term for all the sub-acronyms: CALL. "Thank you for your proposal submission for the TESOL 2019 International Convention & English Language Expo. Your proposal, number 1020-004276, titled, "SMALL: Research, Practice, Impact of Social Media-Assisted Language Learning," has been included in the TESOL 2019 convention program, held on 12-15 March 2019 in Atlanta, Georgia, USA." The title of this event was agreed to by all the co-panelists (Sandy Wagner, Susan Gaer, Elke Stappert, and Maria Tomeho-Palermino, and myself) following my suggestion that we adopt my acronym. And they all agreed :-) Traction at last! CALL by definition is COMPUTER assisted language learning, but these days almost everything has a computer. As Stephen Bax used to eloquently and prolifically remind us, the 'computer' part of CALL has long been tending toward normalization. It no longer seems that the computer part of the equation carries significant weight. The weight has shifted to what computers DO. What computers do best for language learners is to facilitate communication between them and other speakers of the target language, most predominantly through social media. I believe that SM assists LL more than does the old C, so I have been calling CALL SMALL at every opportunity and encouraging people to "think SMALL" in order to de-emphasize the computer part of CALL as we evolve toward SMALL. Language is all about communication, and it is through meaningful communication that students of languages learn them, and to a much lesser extent through learning about the structure of the language (though of course, learning how to correctly shape communication and developing predictive knowledge of the language can help with understanding by helping to decode what people are saying). This in turn facilitates communication which in turn forms the substrate for language learning. I am aware that there is a clamor of other acronyms to describe our field; e.g. TELL, MALL, SMLL etc etc and whenever I nudge SMALL to the fore it is usually drowned out by others suggesting equally qualified acronyms with the same passion as my suggestion. In my presentation I will summarize some of the arguments I have been making for SMALL over the years since I first started mooting the concept in 2009. "Collaborative work is very much needed and workplace collaboration is viewed as a necessary skill for current and future global employees (Jones & Hafner, 2012). In academia, cross-national collaboration is nothing new (e.g., the teacher/researcher in Hong Kong collaborated productively in Google Docs with the section editor in the United Arab Emirates on this piece of work), however, the question we may need to consider is to what extent our students are prepared for engaging in such collaborative work modes?" Using Google Docs to arrive at a publishable version of an article in process appears to have been a new experience for Gavin, but after being exposed to it, he used it in his article as an example of the point he was making to begin with. So, we learn by doing, and pass these skills on through engaging our students in the same and similar techniques. Meanwhile, I am preparing an abstract for the XXth International Computer Assisted Language Learning (CALL) Research Conference to be held at The Education University of Hong Kong, Hong Kong from 10 - 12 July 2019, https://www.call2019.org/. The conference theme is "Social CALL" meaning "the social dimensions of CALL, more specially the social challenges and responsibilities in respected discipline." The call for papers has been issued with abstracts due at the end of January, 2019, https://www.call2019.org/call%20for%20papers.php. I am planning to attend several other conferences this year if my proposals are accepted. These will follow on the trajectory of my work in social CALL laid out in my book chapter on SMALL, as traced from Writing for Webheads and Webheads in Action (WiA) at the start of this century, http://webheads.info, and the three free, global WiA online convergences we mounted in 2005, 2007, and 2009, http://vancestevens.com/papers/evonline2002/wiaoc_index.htm. Another thread binding my work since the turn of the century has been my work with Electronic Village Online (EVO, http://evosessions.pbworks.com/) in which I have participated as both a coordinator and moderator of sessions since 2002. 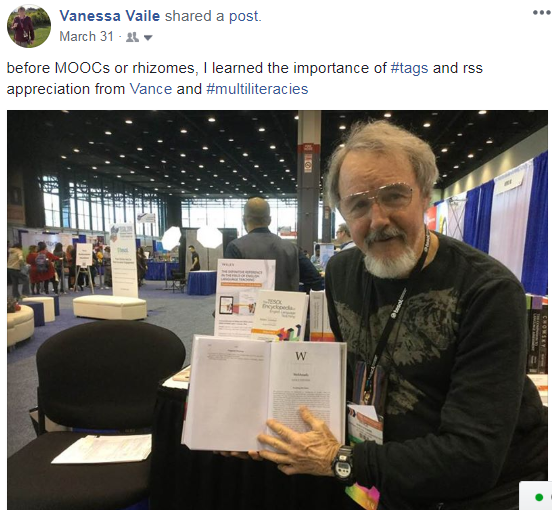 One of my longest running sessions was Multiliteracies, which I conducted in one form or another from 2004 through 2014, and which was known in its latest renditions, once I had bit the koolaid of connectivism, as MultiMOOC, http://goodbyegutenberg.pbworks.com/. My latest and most recent project, run under the auspices of EVO since 2015, has been EVO Minecraft MOOC (EVOMC, http://missions4evomc.pbworks.com/). The social interaction in this project has been best captured in the wide-ranging and graphically colorful interaction of its Google+ Community (G+C, https://plus.google.com/u/0/communities/112993649763396826671). Google plans to shut down this community in April of this year due to known hacking of the platform, apparently because they don't wish to address the threat of congressional oversight as has happened with Facebook since 2016 (and Google+ is not the financial mainstay of Google so they have decided not to defend it). Thus we will need to harvest as much data as we can from this platform before April in order to be able to use what we have built there in any analysis of how we fit in with the participatory culture that makes Minecraft so compelling for language learning. We have already used blog tools experimentally in this effort; e.g. Mircea Patrascu's harvest of posts through the end of the year here, https://evomcarchive.blogspot.com/. We are presently engaged in our most current EVOMC session, #evomc19, so we will need to make a last harvest when the session ends in February. I hope to use the resulting data in my presentations, updating what we have learned about gamification of SMALL through this effort, as it has evolved over the years each year since 2015. The loss of Google+ Communities (G+Cs) is going to be a huge blow to thousands of communities of practice, who stand to lose not only their data and transaction histories, but their connections with one another that were made possible only through the community. 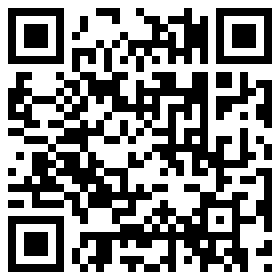 We don't necessarily have a way of contacting the 350 people who are members of the G+C EVO Minecraft MOOC. Our links with each other, except in the many cases where we have formed personal bonds with our community members, is through their Google profiles, which, except when hacked, Google disguises as to true identities. This is sure to be the biggest blow to educational CoPs since Ning withdrew its free services in 2010 (Stevens, 2010) or the more recent demise of Wikispaces ( whose end came on July 31, 2018 for sites used purely for education). It's also going to send all these CoPs out looking for new homes. EVO Minecraft MOOC has already started experimenting with Google Groups and Google Classrooms, though neither seem all that compelling. We have also been considering Moodle, since a couple of people in our group have experience and training on that platform, the platform is free an open source, and training opportunities abound. Other possibilities include (off the top of my head here) Canva, Schoology, Edmodo, Peer-to-peer university (P2PU), Wikiversity ... I'll add to this list as others occur or are suggested to me. https://learning2gether.net/2018/12/17/learning2gether-with-stephen-downes-about-elearning-3-0/. The most interesting thing to me about this and all of Stephen's MOOCs is the platform he has developed for hosting his events, which he calls gRSShopper. The grasshopper flits about collecting content via RSS feeds and couches it all in a platform that runs personal learning environments (PLEs) such as MOOCs. The platform has evolved over the years since Stephen co-hosted the first MOOC in 2008, Connectivism and Connectivist Knowledge (CCK08, https://sites.google.com/site/themoocguide/3-cck08---the-distributed-course). The portal pages for these early MOOCs seem to have disappeared from U of Manitoba's servers, but these early cMOOCs were proofs of concept that algorithms could manage the massive part of MOOCs, the large numbers of participants. The idea was that the participants could learn from one another without any direct intervention from a teacher directing that learning from on-high (in other words, knowledge was distributed through aggregation, not delivered top-down). I recall that Stephen's scripts aggregated all content tagged #cck08 and displayed it via his gRSShopper-driven portal script (and to prevent spam, he required bloggers in CCK08 to register their blogs, and the script would aggravate all tagged content only from trusted users). Here's how Stephen describes gRSShopper. Visit https://grsshopper.downes.ca/ to learn more. 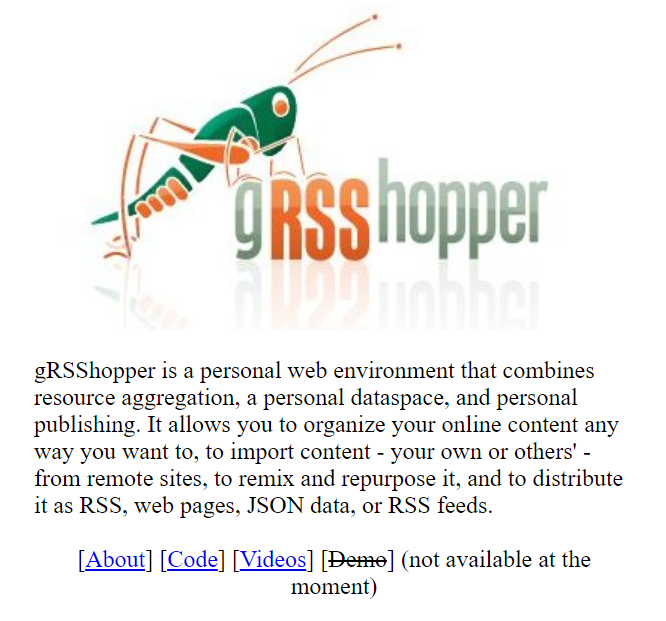 I don't recall exactly how much of the platform was in operation in 2008 but Stephen explained and demonstrated gRSShopper at an Innovation Forum presentation as a prototype for a PLE on Jul 07, 2009. The YouTube link is https://youtu.be/1W6frOLNgLU. Stephen not only uses gRSShopper as the PLE driving all his MOOCs but invites others to use it freely. He explained in some detail during the eLearning 3.0 MOOC how it works and how anyone can do that. You can tease out the relevant material through the links on this page, https://el30.mooc.ca/course_outline.htm, which, if followed systematically, would allow you to replay the entire course. At the bottom of the page, you can see that the page itself is generated from gRSShopper (I did a ctrl-F search on that page to get the notice to highlight in yellow before making the screen capture). This project is one requested of me by the president of APACALL Jeong Bae Son. APACALL is considering holding online conferences. Jeong Bae and other colleagues in APACALL were participants in our WiaOC conferences, which at the time seemed to set a new standard for hosting conferences by using free Web 2.0 tools and ignoring pay walls, as was the norm for other online conferences taking place before that time. Nowadays, the standard is much more rigorous, but Jeong Bae asked me to look into how other conferences host their online events. I've addressed this in a couple of blog posts. My report to APACALL, when I am able to focus on it, will combine an annotated listing of successfully run online conferences, an inventory of essential and desired features in mounting one's own, and some suggestions on how APACALL might move forward on the concept based on what is learned from reacting to the changing playing field given the considerations noted above. Another project I have been working on obliquely is one proposed to me by Jennifer Verschoor a couple of years ago. Jennifer's idea is for us to put our heads together on developing coding as a focus for language learning. We created a rationale for it in Stevens and Verschoor (2017) but we haven't developed the notion much beyond that. In both our cases, we simply lacked time to work on it, Jen because she is in so much demand in her consultancy work, and me because I had a full-time job. Now that my full-time work has ended, that will be one less constraint on our time (once the other wheels alluded to in this post are set in motion and running of their own accord). Stevens, Vance. (2010). The Ning Thing. TESL-EJ, Volume 14, Number 1: http://www.tesl-ej.org/wordpress/issues/volume14/ej53/ej53int/; pdf: http://www.tesl-ej.org/pdf/ej53/int.pdf. Stevens, V. (2015). Finding Your Voice: Teaching Writing Using Tablets with Voice Capability. TESL-EJ, Volume 19, Number 3, Available: http://www.tesl-ej.org/wordpress/issues/volume19/ej75/ej75int/. Also available at: http://tesl-ej.org/pdf/ej75/int.pdf; pp. 1-11 in pdf. Stevens, V. & Verschoor, J. (2017). Coding and English Language Teaching. TESL-EJ, Volume 21, Number 2, Available: http://www.tesl-ej.org/wordpress/issues/volume21/ej82/ej82int/. Also available at: http://tesl-ej.org/pdf/ej82/int.pdf; pp. 1-15. 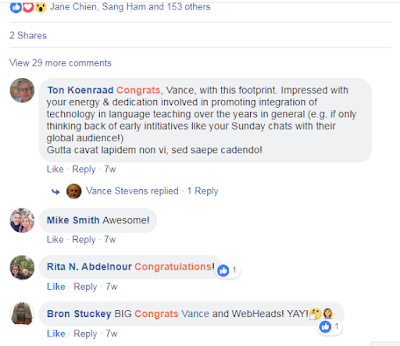 In March of this year I attended the International TESOL Conference in Chicago, where at the Wiley publishers' booth I was able to lay my hands, literally, on a copy of my chapter in the TESOL Encyclopedia of English Language Teaching. 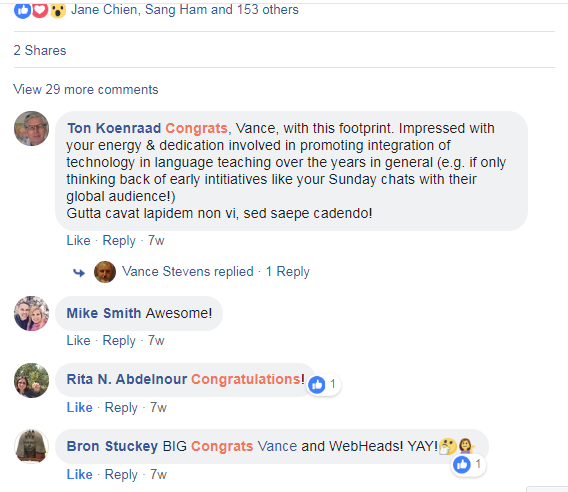 The posts and book chapter make great testimonials to the impact that Webheads in Action has had on hundreds if not thousands of colleagues, associates, and acquaintances in language learning and educational technology, many of whom have become good friends over the years. I imagine my virtual work and social networking with Webheads in Action will continue for some time to come. However, the face-to-face teaching and CALL coordinating I have done in UAE for the past 20 years is coming to an end shortly. This has led me to relate a story. This one starts when Curt Bonk gave a talk at Abu Dhabi Women's College early this century. I was a fan of his due to his writings on learner-centered, constructivist, and sociocultural components of collaborative educational learning tools (e.g. Bonk and Cunningham, 1998, available on Curt's http://www.publicationshare.com/ page, one of his many web pages where he shares whatever he can of everything he produces). I made it a point to attend the talk, which was inspirational, and at the end of it he asked those in the room to share how they would make changes in their practice as a result of what they had learned in his talk. He went around the room drawing effusive promises from participants, and when it came my turn I stood up and said I was going to invite him to come online and speak to colleagues virtually in the group that I had been interacting with, Webheads in Action. He looked at me oddly, nodded, and quickly moved on to the next person. Curt has kept in touch over the years, and when Curt's friend Jay Cross came to Abu Dhabi, Curt encouraged him to get in touch with me. On the afternoon of the last day of the conference Jay was involved in, not one to which I had been invited, he called my mobile cell phone, and I agreed to come and get him at the Abu Dhabi Hilton and show him the town. His first request was to visit a beach, so I took him to the nearby stretch of sand where the Emirates Palace Hotel now stands and he got out of the car, took his shoes off, and walked on the beach happy as a kid, squishing the sand in his toes. I don't recall where else we went but we had a delightful time, ending at a fish souq on the piers where the dhows used to moor, and I picked up a kilo of shrimp and I brought him up to our apartment with its night view of the Abu Dhabi corniche where my wife Bobbi fixed it for dinner. When I returned Jay to the Hilton late that night he was well refreshed. https://brightgreenlearning.com/2007/08/talking-about-tagging-finding-our-event.html, mentions that I gave a "very interesting presentation" and promises a post about it "later" (still waiting :-). But it also mentions that Buthaina Al Othman was one of the speakers at this conference. And as this post is about the spirit of Webheads, this requires another aside. Buthaina, whom we knew as Buth, was one of our original Webheads in Action participants in 2002, but we did not meet until Sunday, November 16, 2003, when Michael Coghlan and I were scheduled to be presenters at the annual and entirely online Global Learn Day VII event. Michael was one of the co-founders of Writing for Webheads, and our presentation was on "Meet the Webheads: An experiment in world friendship through online language learning." Our presentation was unusual in that Michael happened to be in Abu Dhabi, so we had arranged to cybercast our presentation live from the Lecture Hall where I worked at the Petroleum Institute, Abu Dhabi. I had invited my colleagues at PI to come and witness the event, but it was late in our working day, and I was told later that we were competing with a rugby test on the telly, so only 5 or 6 of my real-life colleagues were there to occupy a few of the 100 some odd available seats. But Buthaina flew from nearby Kuwait to Abu Dhabi especially to be on hand to join us in the live presentation. Buthaina posted pictures and archived the event at her website: http://alothman-b.tripod.com/wia-buth-gld.htm, which amazingly remains online. Michael became the Webheads community troubadour after composing and recording our theme song, "Webheads all over the World", available on Wikispaces until July 31, 2018. Listen soon! (or maybe Michael will post it elsewhere for us. To bring this aside to a close, I next met Buth in person at the 9th EFL Conference at the American University of Cairo, held in January, 2004, where I had been invited to deliver a plenary address (Stevens, 2004) and a few workshops. As a guest of the conference organizers, including the US Embassy in Cairo, I was invited to many events in the course of my stay, and as Buth and I were often seen together at the conference, she was usually included in the invitations. To the many people we met, I was introduced by my proper credentials and as one of the speakers at the conference, and Buth was introduced as "a Webhead." Buth was first to notice this pattern, which we interpreted as a sign that Webheads had taken on a stature in the context of this conference whereby it was as natural to introduce someone as a Webhead as to give their affiliation in the normal way, and it seemed to be accepted on as equal a par by the professors at the event as with any other identity. This would be an extemporaneous event. I dubbed it "F.U.N. Fare - UnWorkshop on Computer Mediated Communications Tools for Distributed Social Learning Networks." F.U.N. was an acronym I had coined standing for Frivolous Unanticipated Nonsense, which I was arguing in those days that teachers should tolerate, even encourage, in their teaching in order to push their lessons toward the bleeding edge of the envelope of what was possible in engaging their students (and each other) with the newly emerging enabling Web 2.0 technologies. 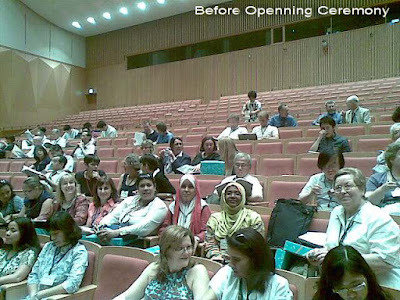 Buth appears in the picture at the top of that web page, taken at the conclusion of the colloquium; she used to often attend TESOL conferences in that era. David Nunan appeared on the program (with Curt Bonk) at our Webheads in Action Online Convergence the following year, 2005. The gentleman on the right is another Webheads participant, Jeong Bae Son, president of APACALL. I introduced that final, unplanned and unanticipated, unWorkshop event in Alexandria as a concatenation of two convergent communities of practice, Webheads in Action and http://worldbridges.net/, who were constantly together exploring new computer-mediated communications (CMC) tools for percolating knowledge through their overlapping distributed learning networks, and leveraging many properties of social networking (Lebow, 2006). I promised that members of those communities would be invited to join us online, and the (un)workshop would take place informally, without fixed agenda, and in response to the direction suggested by the online participants and those present in Alexandria. Online participants would find Vance on Skype ID vancestev. This would be streamed at http://www.webcastacademy.net/listen. Webcastacademy volunteer Jose Rodriguez agreed to handle the backup stream. Vance Stevens, of the Petroleum Institute (Abu Dhabi) and founder of Webheads in 1998, gave a two hour Un-Workshop this morning at our Arab Region New Learning for Sustainable Development Workshop that he titled F.U.N. * Fair: Computer Mediated Communications Tools for Distributed Social Learning Networks. This was a face-to-face un-workshop, a veritable souk of activity, connectivity and interaction both in our training room at the Library of Alexandria, where we are now in Egypt, and with his online colleagues from Barcelona, the West Coast of the US, and so on, who joined us in Second Life, on skype and on worldbridges.net. Today was a case of if anything can go wrong it will. The Alexandria Library is about a ten min walk from my hotel. There was no point in arriving at the conference hall too early because the rooms would all be locked until just before the start time of my session, though once I got into the center, wireless Internet would available from anywhere inside. So I left my hotel 45 min before I was due to present, carrying two laptops, wires, a USB mic, webcam, adapters, etc. Though the presentation room was locked when I got there, I got out my computer and booted it, and waited for someone to open the door to let me in. At 20 min before the start of my session, someone came around with keys, so I got into the room, plugged the laptop into the mains, the one with webcast software installed and ready to go, and discovered my first problem of the day. My a/c adaptor had not been working well, I was having to massage it over the past week to get the charge light to hold, but today it didn't want to charge at all. 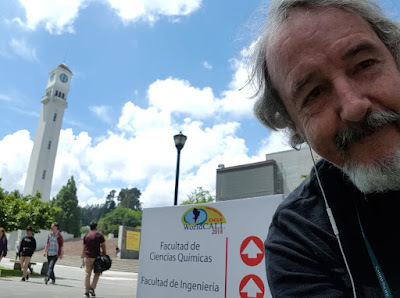 I worked with it for a couple of minutes, decided to leave it for a while, and started Skype to keep my appointment with Jose Rodriguez who had kindly offered to backup my stream at http://www.webcastacademy.net/listen. Jose was online and on task. He informed me that he was streaming at that moment on Sandbox B. I was expected to take A since I'd been planning to demonstrate streaming at my unWorkshop but working with the charger required two hands and was taking valuable time. Nevertheless I managed to keep up some kind of chatter in the Skype stream, and Jose reassured me that all was well there. Meanwhile I turned on my second computer, which I planned to use for Second Life. A technician arrived and helped get the projector on my webcasting laptop projecting onto the wall. I looked for Nick Noakes in Second Life but didn't see him, so I left it and went to the Webcast Academy chat room and texted to the people there. Sasa (one of my Webheads collaborators on the Writingmatrix project, http://writingmatrix.wikispaces.com (note from 2019; we moved this to http://writingmatrix.pbworks.com/) and Stevens et al. 2008) and someone else were listening to the stream but unable to Skype in, so no voices were joining Jose and I. Graham Stanley meanwhile offered me a teleport to a space called Egypt in SL. I completely forgot about Twitter. With battery depleting on my laptop, I worked the charger every chance I got, trying to find the magic fit for plug in socket that would get it working. My battery was a quarter low when participants started showing up fifteen minutes into start time. They had been delayed by a previous event that had run overtime. I asked the first person to arrive at the un-workshop in Alexandria Egypt, Ule from Germany, to take over talking with Graham in Second Life Egypt. Three or four others followed and I tried to explain to them what I was doing while also addressing participants online in the stream. It was clear that the on-site participants in Alexandria were most interested in SL and they came around behind that computer, while the EdTechTalk chat (Worldbridges) displayed on the big screen. There wasn't much Graham could show us in Second Life Egypt so he moved to Boracay and teleported us over. Ule passed the chat to the next person, and so on as newcomers arrived, and Graham was very welcoming to each newcomer. My wife Bobbi, from her computer in the UAE, arrived in World and we teleported her to Boracay. Graham was by now speaking to us, voice having started working by magic in SL, and we started voice-chatting with Graham there. clearly audible in the Webcast Academy stream being maintained by Jose, according to feedback from Jose. The SL computer now had the attention of the face-to-face audience so we switched the one monitor projector to that computer which was configured for hi res. This caused the projection screen to split down the middle but I didn't notice at first. I was still text chatting in the EdTechTalk chat room, working out who could and who couldn't join us in SL, and trying to talk to those who could access SL and help them reach the location where we were in SL by offering friendship, and then extending a teleport. This took us up to the top of the hour, 10 a.m. in Alexandria. At about that time Buth and several others arrived from elsewhere at the conference in Alexandria, and we had to explain to the on-site newcomers what was going on. At about that time the mic on my Skype chat simply stopped working. I became aware of it when one of the distant participants, Jason, kept dropping out and trying to reach me. He would call, I would answer, but he couldn't hear me. I called him, he answered, hello? Hello? And then he would ring off. I tried troubleshooting, but couldn't find the problem without being able to drop everything else and focus on it. I was also trying to give the newcomers some clue of what we were doing, and prevailing on Buth to get into Skype on her laptop and tell Jose what was happening. Meanwhile the battery on my Skype computer was getting worryingly low. I still couldn't fix the power supply, and I decided to just switch that computer off so I could do a controlled shutdown rather than lose power and not be able to retrieve my most recent files later. 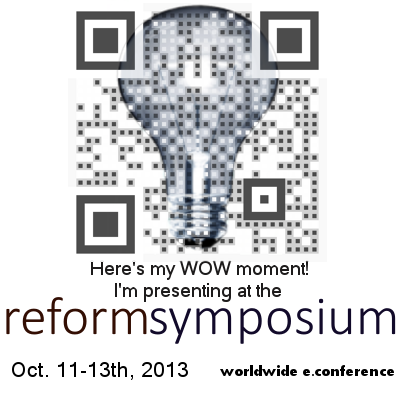 This removed me from the stream and EdTechTalk text chat. Meanwhile Graham was taking the conference delegates around Better World, a water conservation simulation, and they were greatly interested. At one point Graham suggested they fly to another part of the island and the delegate at that moment on the keyboard held down the up button and soared into space. We didn't realize what he was doing till he was well out of earshot of Graham (in SL you can only hear people talking when you are near to them in-world). He was very much enjoying the sensation of flying but I had to take control and get teleported back to where Graham was. Meanwhile there was a request in the face-to-face audience that we show them Elluminate so I decided to start it on my Second Life computer. I launched Mozilla and was surprised when I typed in the URL that an IE window was launched separately. At the same time a McAfee notice came up demanding action. This was a month-old computer and McAfee had been bundled with it free for one month (but with a debilitating Catch-22). In fact, this was Bobbi's computer and she had noticed before I borrowed it for my trip that McAfee was about to expire. She had installed Avast on it but had not removed McAfee. Now McAfee was informing me that it was no longer protecting my computer and that another program (Yahoo Messenger) had wanted to visit the Internet and I would need to type in my credit card details right there and then in the middle of my unWorkshop. This being a very unwanted distraction at that point I tried to dismiss it and close the IE window but that window froze and the browsers ceased to function. I discovered later when I had a chance to look at it that McAfee had basically blocked my browsers from accessing the Internet (though SL and IM chats continued to work) and only when I removed the program completely was I able to browse the Internet again. But at this moment in my presentation I went to the Task Manager and tried to find IE in order to kill it. It was open and frozen on my computer screen but it wasn't listed under applications running, so I switched to processes, found explorer listed there, and zapped it. This turned out to be windows explorer so I lost my task bar. At that point there was nothing to do but reboot, goodbye to Second Life. I informed the SL crowd of that. Graham had gone to breakfast by that time anyway, having taken everyone to Camp Dharfur, on our way to what I had wanted to show them: Meteora. We were now at the top of the second hour, and had half an hour to go in the unWorkshop. We still had Buth's computer in Skype and the Webcastacademy text chat. So while my computer was rebooting I decided to make Buth's computer display to the room via the projector, and meantime to run Elluminate from one of the 6 other computers in the room. One of the participants was talking to Jose, who was still doggedly streaming the proceedings via Worldbridges. We hooked up Buth's computer to the projector and hit the key combo that should have toggled screen modes. However we got an error at the projector, illegal resolution (not just a 'no signal') and Buth's screen display disappeared! We toggled over and over, no projector display, with Buth's screen now unusable. Our on-site participant was still chatting with Jose, Skype sound being unaffected by the problem, however we had to explain to the stream that we were going to have to go off the air for yet another reboot. With 15 minutes left in our presentation our face to face participants had nothing to see except as they were milling about behind us watching us try to recover. When my computer came back on I adjusted screen resolution down so that it now synched with the projector and no longer gave a split screen and I returned to SL. Richard, another distant participant, was there, having found us via the Worldbridges stream. His voice in SL was working well but he was hearing his echo because I had no headphone on my SL computer, so I decided to plug in the USB mic there because there is an on-off switch on it which would allow us to mute our mic while he was talking. This new computer had the new Vista, and of course Microsoft in its wisdom has changed the interfaces for configuring sound from the familiar XP way, so I was having to figure out how to get at my mic controls and disable the onboard one and configure my computer to accept the USB one. This took another pregnant couple of minutes but meanwhile Buth had restored our presence in the Skype event and in the EdTechTalk text chat, and technicians were working on getting the third computer into Elluminate and projecting that onto the screen. They left when that was done but we discovered that whereas we could now text chat in Elluminate we could neither hear nor speak there. We had Elluminate on our overhead projector, text only, we were in the Skype stream, and we were talking to Richard in Second Life at Camp Dharfur, and to Graham who had by then returned. We were at the end of our allotted time but the master of ceremonies for the plenary coming up in Alexandria was with us and enjoying the show. The technicians had by then returned and got us speaking in Elluminate, and we could hear what was being said. Since the master of ceremonies was the one who had requested that demo, she was in no hurry to make us stop. So, something interesting happened. We were talking to Graham and Richard in Second Life and to Jose, Sasa, and Moira (who had participated in our Webheads in Action Online Convergence in 2005; see Hunter, 2006) in Elluminate (Hala, a Webhead participant from Sudan, had just left). Graham was in no space other than SL, and as these were separate spaces, I was going to my SL mic to talk to him and to the Elluminate computer to talk to the others. But Richard noted that when I spoke in Elluminate, he could hear what I said on his computer. It clicked that Jose was streaming Elluminate into the Webcast and Richard was hearing that. So I could talk to Richard as well as everyone else in Elluminate and he could respond to us in SL voice. It occurred to me then to include Graham in the conversation by talking into the tethered USB and Elluminate mics at the same time. This caused Richard to hear my SL chat (and then get the delayed rendition in the stream so he had to turn that off) but we had successfully patched a conversation taking place in SL into one going on in Elluminate, and for those in the unWorkshop it was one of those WOW moments. I'm not quite sure how we got there. In the past three hours we had had almost every conceivable meltdown. Starting with equipment failure, power adaptor failing to function, relegating the prime presentation laptop to limited use -- we had moved on to browser crash brought on by McAfee crapware, that sort of design being the reason I had declined to purchase the program in the first place, and subsequent reboot. We had lost Buth's display at about the same time, and had been working with split screen projection up to then where my computer video signal was incompatible with the projector resolution (easily resolvable, but when you are juggling so many balls that some are bouncing on the floor, what would be more obvious at a calmer moment remains ellusive). With two computers down we had fought through technical problems with a third computer and managed to get all computers running in the end and bring the unWorkshop to a close on an epiphany moment. Later in a plenary recap session, feedback on our unWorkshop was positive, with all concerned saying they had learned a lot from Webheads. The only criticism was that SL appeared to be perhaps too addictive, potentially could take time away from family, and of course that it would be perhaps inaccessible to a majority of stakeholders the sustainable ecologies people were trying to reach in places where the pinch of limited resources is being felt most. Other than that the participants seemed to be quite taken with the potential, and spoke of having eyes wide opened. Many thanks to Buthaina for her competent and timely support! Amazing dedication Rita (Zeinstejer, another Writingmatrix collaborator, Stevens et al. 2008). Thanks John for your kind encouraging words (John Hibbs perhaps, founder of the Global Learn Day movement), and Graham you were the star of the show, taking everyone on voice tours of eco simulations in Second Life. As this was for a conference on environmental sustainability, the conference delegates were really putting the twos and twos together as a result of their encounter with Webheads in Action. And that, dear children, is the true and enduring spirit of Webheads in Action. Hunter, M. (2006). Are You on the PD Cybertrain or Still Hesitating? IATEFL Poland Computer Special Interest Group Teaching English with Technology A Journal for Teachers of English ISSN 1642-1027 Vol. 6, Issue 3 (August 2006). Available: http://www.tewtjournal.org/issues/past-issue-2006/past-issue-2006-issue-3/. Lebow, Jeff. (2006). Worldbridges: The Potential of Live, Interactive Webcasting. TESL-EJ 10, 1. http://www.tesl-ej.org/ej37/int.html. Stevens, V. (2005). 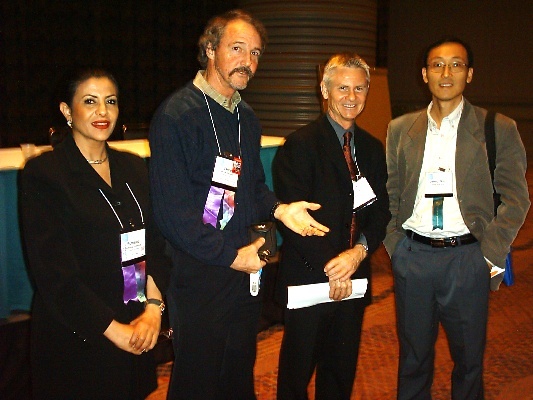 Computer-mediated communications tools used with teachers and students in virtual communities of practice, in S. M. Stewart and J. E. Olearski (Eds), Proceedings of the First Annual Conference for Middle East Teachers of Science, Mathematics and Computing (pp. 204-218). Middle East Teachers of Science, Mathematics and Computing: Abu Dhabi. Stevens, Vance. (2004). The Skill of Communication: Technology brought to bear on the art of language learning. TESL-EJ 7, 4 (On the Internet). http://tesl-ej.org/ej28/int.html. The following is a rationale for using Minecraft with students where I work teaching EFL in a military academy setting. I thought I would post it here and perhaps develop it further (and I in fact have updated this slightly in April, 2018). Minecraft is a game involving critical thinking, collaboration and cooperation, strategic analysis, creative engineering, and architectural skill that is extremely popular in its own right. In 2016 50,000 copies a month were purchased and 40 million players a month logged into the game (according to Jeff Kuhn in Kuhn and Stevens, 2017, see reference at end of this post). It is particularly being utilized in education where teachers wish to promote the skills listed above in their work with students. As evidence of how seriously this has impacted education, Microsoft has bought the game from its creators Mojang and is marketing it at huge conferences such as ISTE where their workshops on Minecraft are attracting lines out the doors of educators eager to learn more and use it in their classrooms. Why in a military academy context? I think it would be of particular use in my context because the game is designed with fascinating depth to suggest seemingly endless possibility. It emulates military skills such as strategic thinking, establishing a base in a wilderness, protecting it from threats arising in the game, and teaming with others to develop their base through finding resources that can be put to use in creating objects to further team goals. Use of Minecraft would introduce elements of gamification in our coursework (as opposed to using ‘games’ in class, which is not the same as gamification). Students could communicate with us in various ways about their experiences playing the game. The things you can do in Minecraft are limited only by your imagination. You can find coal and iron and create metal objects, such as railroads, where mine carts you can ride in are powered through redstone, so you can build machines that work on wiring you devise. You can set logic gates, and program in the game. You can build and fortify, set up farms so you can feed yourself and others, raise animals, and grow your own trees so you have an endless supply of wood. You have to employ strategies and carry out advanced planning to thrive in the game. Often players will work in teams. I created this set of Minecraft challenges for my students in the military college where I work. The challenges are designed to get them to take the tutorial that comes with the Minecraft Edu version, cross the ravine at the end of the tutorial and explore the world on the other side, and eventually parachute into a wilderness where they have to establish a perimeter, defend it, and sustain and develop it in cooperation with other players in their platoon / team. Smolčec, M., Smolčec, F. and Stevens, V. (2014). Using Minecraft for Learning English. TESL-EJ, 18(2),1-15. Retrieved from http://www.tesl-ej.org/pdf/ej70/int.pdf. Dodgson, D. (2017). Digging Deeper: Learning and Re-learning with Student and Teacher Minecraft Communities. TESL-EJ 20, 4:1-12). Available: http://www.tesl-ej.org/wordpress/issues/volume20/ej79/ej79int/. What is needed to get Minecraft working where you teach? The Mojang user ID allows you to play any version of Minecraft. There are many versions with different capabilities. Trusted users are normally white-listed on servers, so in practice you can only play as a single player, or on servers where you are allowed to enter. In order to fully exploit the game in education, it should be played in community mode on a server available to multiple simultaneous users. The full PC / MAC version of Minecraft is the most versatile. We are looking to purchase licenses for the education edition which I am not familiar with first hand, but it allows up to 30 to play at once, according to http://minecraft.gamepedia.com/Education_Edition. It is also possible for us to get a free trial for a limited time. This brings us to the most important thing needed, and that is a cohort of teachers who are aware of how Minecraft can leverage their learning and that of their students through gamification. Two years ago, in 2015, my interest in Minecraft as a tool for this kind of learning was such that I organized an Electronic Village Online session for the purpose of learning how to play the game and understand how we could use it to gamify learning environments. We have just completed our third year of the community that was formed then. I have become an accomplished player, and I have a network of other teachers (plus Paul) who can help us with the server side issues. To start a similar teachers’ group at your institution you'd need to install the software where teachers can use it and show them how to play there using user ID from the pool requested. Where I work, we will have to experiment with networking other devices so teachers can play in leisure time, which is needed for them to become familiar enough with the game to see how their students might learn it and use it for productive class purposes. It is not necessary in this game that teachers be authoritative sources of knowledge. Students and other players will inevitably make discoveries which they will be eager to share with peers and teachers alike, using communication skills we are trying to teach them. Dikkers, S. (2015). 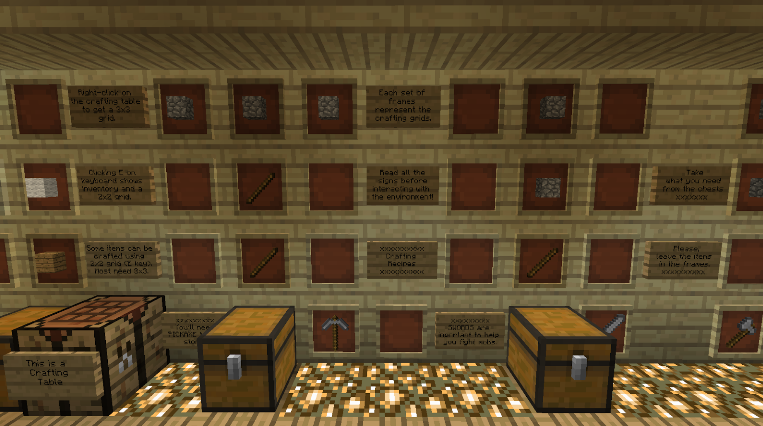 Teachercraft: How teachers learn to use Minecraft in their classrooms. Lulu.com. Available: http://press.etc.cmu.edu/files/Teacher-Craft_Dikkers-etal-web.pdf. One of the contributors to that book is Jeff Kuhn, who is on our team of expert co-moderators of EVO Minecraft MOOC. He and I have just written an article which we have submitted to TESOL Journal, having been invited to do so by the journal editor. The article appears in the December 2017 issue of TESOL Journal, where if you are a TESOL member, you can log in and read it for free. Kuhn, J. and Stevens, V. (2017). Participatory culture as professional development: Preparing teachers to use Minecraft in the classroom. TESOL Journal 8, 4:753–767. https://doi.org/10.1002/tesj.359and http://onlinelibrary.wiley.com/doi/10.1002/tesj.359/full. On Friday Feb 3 I am scheduled to give another talk about EVO Minecraft MOOC. 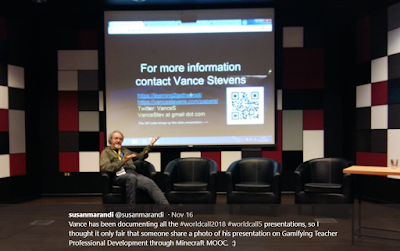 I have given several such talks over the past couple of years, and usually I focus on how EVO Minecraft MOOC serves as a game board for teachers to learn through experience about gamification. I normally make the point that whereas we play Minecraft, we are really learning about constructing learning environments that are compelling and self-directing, and whose basic premises might apply across a range of subjects and classroom contexts. In my presentation Friday, I might try and encapsulate some of this as background, but in this presentation I want to discuss recent developments with the EVO Minecraft MOOC community as it has evolved over the three years we have been a community. Many aspects of this evolution have themselves taught us a bit about gamification. When we started EVO Minecraft MOOC in 2015 our approach was a departure from the norm in EVO sessions in several respects. For one thing we were the only EVO session that required a purchase, albeit a modest one (less than $30 per user ID paid to https://minecraft.net/en-us/). Secondly, as I have done in all my EVO endeavors, when we started a Google+ Community page, we remained in the same community space the year after, and the year after that (most EVO sessions, even if they have the same name and same moderators one year to the next, start the following year in a brand new community space, on the assumption that newcomers like to feel the session is unique to them). Another way we are different is that, although we have a syllabus, we have been using it less and less. We ascribe to the Community as Curriculum model (Cormier, 2008) which encourages participants to drive what we do rather than expecting them to follow a pre-ordained path through our program. One interesting aspect of this is that, as we have evolved in our third year, our approach has changed to the point that we hardly even have tutorials. This was not so in the beginning, when we assumed that we would have to teach people how to play Minecraft from scratch. In our first year we started with a flat map server in creative mode and all met there. Monsters are benign in creative (in fact, we use them for target practice) and players have access to a full range of materials available in the game; whereas in survival mode, monsters are lethal, and players must find materials in the game and keep them safe from loss through unexpected demise. In our first year in EVO Minecraft MOOC, experts like Jeff Kuhn and his colleague Aaron Schwarz, and our young moderator Filip Smolčec showed us how to build and craft and delighted us with plagues of rabbits, booby trapped buildings, railways powered on redstone, and other such whimsical structures. We stayed safely in creative mode for about 3 weeks, and in week 4 (in the 5-week session) when we logged in, we suddenly found the server had changed. It had mountains and forests and rivers and monsters, which discovered us almost as soon as we arrived there, so we learned a lot about respawning (coming back empty handed after dying in the game) and consequently, how to prevent that. But we also learned another important thing about gamified environments. We survived in survival mode because Jeff and others had prepared safe houses for us, so we could go out and explore in the daytime, when monsters are less threatening, and get indoors at night when they tended to prowl. When I retreated to one of Jeff's houses, he was sometimes home, so he would take me mining with him. He showed me coal seams and other places we could get resources, and he mentored me on what to do with them. We ended our 5-week session on that positive note. I was feeling good about the game with the help of others more knowledgeable in the game itself. This narrative has a personal side to it, because another point I have made in previous presentations is that I started this community in order to learn about Minecraft. I had been interested in the game for a long time but had not found a way to play it in multiplayer mode, most communities of students being closed to old gray-heads like myself. I got the idea to start the EVO session in order to attract experts to teach me and other noobies like me. So in our first year, I learned the game basics. But in my first year, apart from a small structure I constructed with the help of my son, who had joined me one day in creative mode, I hardly ever built anything. I was very busy organizing the session and the online events we would hold for it, but I did not have time to learn to craft proficiently, nor to create structures similar to those that were going up all around me. I tend to be slow on uptake. Like a child who never speaks until one day the floodgates open in surprisingly imaginative discourse, I am a slow absorber of creative genius, before I can set out on my own. Also after the first successful session in 2015, I didn't go back on the server much in the interim before the next one. I went to the TESOL Conference in Toronto and met Jeff Kuhn (he reminded me we had already met :-) and renewed my acquaintance with Aaron Schwarz (at the time, chair of the CALL Interest Section; I had been the first chair of that interest section 30 years before that). I hung out in brew pubs with the Ohio University crowd and by the end of that had their assurances that we would have a second year of EVO Minecraft MOOC, and they would once more host the server. That was great news. So the next year we trotted out the same proposal and syllabus as before, but this year I moved a lot of the syllabus to a wiki at http://missions4evomc.pbworks.com/ where I thought some of the explanations of how the session was designed could be better broken down and managed. The previous year we had worked from a google doc syllabus page, and in 2016 a lot of those syllabus items were still there but now pointed to the wiki. Design-wise, I was trying to get the Google+ Community landing page to be a one-stop "game board" where everything anyone needed to know about the session (in effect, a course, as in the 'C' in 'MOOC') would be accessible in links from the G+C game board. It seemed to work. We had a lot of new people in the session, they pretty much figured out what to do, and got on with it. The session was badge-oriented, which is to say that about a third of the two dozen people who were truly participating were tracking their progress through the badge system. I've explained that thoroughly elsewhere, but what this means, is that they were following the syllabus and ticking off the benchmarks. The game board worked in that they were not asking a lot of questions, and they were building in our creative server and posting pictures in blogs, and otherwise documenting what they were doing. So we were seeing that we were effectively reaching our participants, or at least a small but creatively engaged number of them. But we also were attracting experts. One of these was Mircea Patrascu, who used scripts to create fascinating structures in creative mode, most notably entire towns with subway stations and tunnels with underground tracks leading to other parts of our server. At one end of this metro network was a structure with logic gates where if you answered three questions by setting three levers correctly, a door opened and you were admitted to a huge hangar with a roller coaster inside. You sat on the mine cart and pressed a button and off you went on the ride of your life, up and down and around. The structure was incredible, and Mircea recorded the ride on YouTube https://youtu.be/nJQhvLjtQn0. Our star moderator that year Bron Stuckey gave a talk on what she was doing in MC, http://learning2gether.net/2016/01/24/bron-stuckey-and-evo-minecraft-mooc-projects-and-challenges-designing-and-building/. Jeff Kuhn gave a keynote on what was possible with Minecraft, http://learning2gether.net/2016/01/17/learning2gether-with-jeff-kuhn-on-minecraft-an-introduction-to-whats-possible/. Our participant Thorsten Groß took us on a tour of his hochschule where the students had built a replica of the school where Thorsten worked, and conducted us around it, http://learning2gether.net/2016/01/31/thorsten-gross-students-conduct-tour-of-ricarda-huch-schule-for-evo-minecraft-mooc/. Librarian Beth O'Connell hosted an EVOMC16 Server Party at VSTE Minecraft sandbox, where her own MC community was creating builds in the same spirit as we were, http://missions4evomc.pbworks.com/w/page/104666848/Live_events#SunFeb7BethOConnellhostsEVOMC16ServerPartyatVSTEMinecraftsandbox. Midway through our session, when we had gone by then into survival mode, we were joined by another talented expert Linda Gielen, who made a video explaining some of the things she was building on our server. She and Rose Bard, another of our new moderators for that year, primarily developed our server so that there was an elaborate safe house there, and also a spawning point admin building with an accompanying tutorial area set up by Aaron Schwartz which taught newcomers how to craft using sticks and cobblestone, two easily acquired resources in Minecraft. There was also a warp chamber which you could step into to transform into another world, I believe it was back to our creative world (need to check on that). Linda and Rose set up maps, and storage boxes for everyone at the admin building. We needed only place a sign on one to claim it. I don't think I even managed that in 2016. All my time was taken in organization. I resolved that the following year, I would spend less time organizing and more time playing. It was my turn to gamify. MP included some photos in his blog post which a bunch of us used to align ourselves in the biome and eventually find his temples. We did this in the course of several sessions partly documented here: https://learning2gether.net/2016/09/06/gamifying-professional-development-evomc17-minecraft-mooc-playdate-2/. In conducting these quests, we further learned about the pleasure of meeting online in this vitual space, as well as the benefits in supporting one another in our mutual learning journeys. This event created another milestone, tangible affirmation that our G+C had formed a community. Although some work was going on between EVOMC16 and EVOMC17 to prepare the server for the 2017 session, this was the first time of which I’m aware that community members, albeit moderators in this case, met on the server for such sustained practice and pleasure when EVO was not in session. As we make our way through EVOMC17 we see more evidence that we are a community of practice with connections to one another that extend beyond EVO. Since our inception, we have themed our 5 weeks on Dave Cormier’s 5 steps to coping with MOOCs; namely, orient, declare, network, cluster, and focus. Time after time we see our pattern of activity fall around this model, and we’ve labeled each of our weeks accordingly in our syllabus and wiki documents. In this third rendition, there has been very little mention of our syllabus goals, but things are simply falling into place in the pattern that Cormier described. This year there has been, apart from recycling and improving on extensive documentation, very little direction on the part of moderators, and few questions on the part of participants. The scale of participation has been similar to what it was in the past, but there has been little evidence of people asking how to play MC in the Google+ Community, and some evidence of people going into the game and figuring things out from scratch, of course with help and guidance from proficient players already in the game. In other words, there has been little demand for directives from participants in EVOMC17 not in the game, whereas a lot of learning appears to be taking place in the game. The community that has gathered in the game has been a facilitator of this development, but another factor is adults who enter the game with their kids and develop proficiency with impetus and guidance from their children. Marijana Smolčec, one of our first co-moderators, as a good example of this (and her son Filip became yet another co-moderator and was well respected for his expertise and childlike spontaneity). Rose Bard, who became a co-moderator in 2016, is often accompanied in MC by her son Emmanuel, and a new member, Jane Chien, appears to be drawn there with her son Mattie. Another of our co-moderators, Mircea Patrascu, is an expert in MC who uses it to teach coding to children, and he often works with the help of his son Vlad. We have 296 in the Google Community, 23 who filled in the registration form for this year, 15 from that number who have actually been on our server, but a number of others who have been on the server from previous years in our community or have been whitelisted there without having filled in the form (e.g. some community members are there with their kids, always welcome :-). We have a solid core of around two dozen committed, active, and awsome creators in-world. These latter are modeling and learning amazing stuff with one another. What makes EVOMC so awesome and special is the participation of kids with their parents! It looks more like a family gathering than a session! We are also attracting people from other communities. How can we as a community envisage the end of this? Most EVO sessions do end. Our members have formed addictions and bonds and challenges that will keep us going in world long into 2017. This remains to be seen. 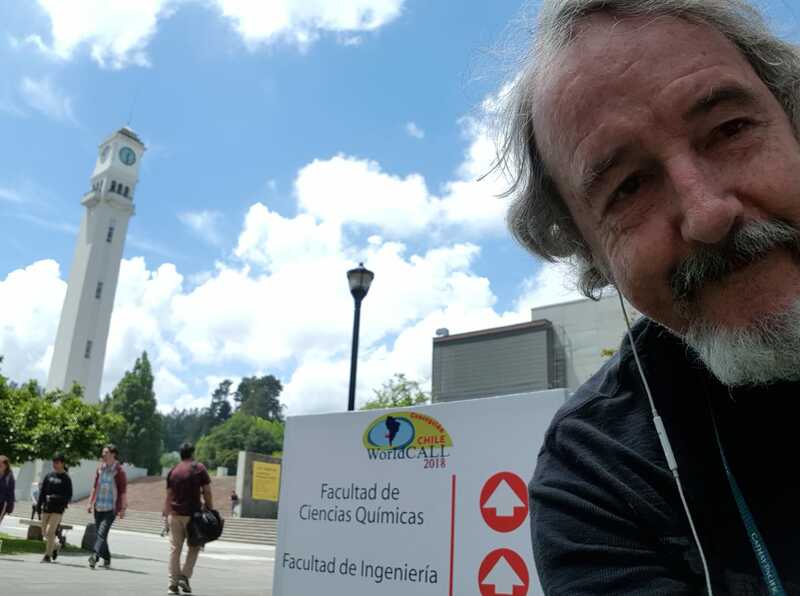 Like one of Jeff’s treks, EVO MC MOOC is off on an adventure, a quest without a foreseeable end. More dispatches follow. which was seeded by the blog post you are currently reading.